SHAH ALAM: SP Setia Bhd posted a 30% year-on-year jump in net profit to RM327.97mil for its financial year ended Oct 31, 2011 (FY11). The property developer attributed this mainly to higher selling prices for new launches and the stabilisation in the prices of construction materials. Revenue also increased 27.9% to RM2.23bil. The group also set a new full-year sales record in FY11 of RM3.29bil, a 42% increase from the previous record of RM2.31bil set in FY10. It was the fourth consecutive year of increase in the group's sales and represented the second consecutive year that total group sales had exceeded the RM2bil mark, said SP Setia in a Bursa Malaysia filing. SP Setia has proposed a final dividend of 9 sen per share. Together with the interim dividend of 5 sen per share, total dividend for the year works out to be 14 sen per share, representing a payout of about 59% of the group's net profit. The group's profit and revenue were largely derived from property developments in the Klang Valley, Johor Baru and Penang. Ongoing projects which contributed included Setia Alam and Setia Eco-Park at Shah Alam (Selangor), Setia Walk at Pusat Bandar Puchong (Selangor), Setia Sky Residences at Jalan Tun Razak (Kuala Lumpur), Bukit Indah, Setia Indah, Setia Tropika and Setia Eco Gardens in Johor Baru and Setia Pearl Island and Setia Vista in Penang. President and chief executive officer Tan Sri Liew Kee Sin said the group was aiming to achieve total new sales of RM4bil in FY12. “This is despite factors such as the external headwinds from the economic uncertainty in Europe, and Bank Negara's guidelines seeking to further encourage prudence in bank lending,” he told reporters. About 90% of new sales in FY12 would come from Malaysia, with the balance from foreign markets. Liew stated that the group had strong branding, and offered an extensive range of products that cater to diverse market needs. The group's recent launch of its integrated green commercial and mixed residential development, KL EcoCity (Kuala Lumpur), is expected to contribute strongly to sales in FY12. Other recent launches like Fulton Lane and EcoXuan, the group's maiden project in Melbourne and second project in Vietnam respectively, are expected to also help augment sales in FY12. Meanwhile, Liew said he was not too concerned about the recent 10% increase in stamp duty for foreigners buying homes in Singapore. “We target 70% of our product range in Singapore to cater to local upgraders. Foreign buyers will be about 30%, so we do not think there will be much of an impact,” he said. Liew also said SP Setia was interested in making another bid to secure the project to redevelop London's Battersea Power Station. SP Setia had submitted a 262mil (RM1.3bil) offer for the project in November that was turned down, before recently making a a second bid of 324mil (RM1.6bil) that was also rejected. SHAH ALAM: The proposed management agreement between property developer SP Setia Bhd, its president and chief executive officer Tan Sri Liew Kee Sin and Permodalan Nasional Bhd (PNB) is a “win-win” for everyone. Liew told reporters that the proposed management agreement was now subject to the approval of the Securities Commission (SC), which has the option of requesting for an extraordinary general meeting (EGM) concerning the proposal. “If the SC clears the proposal, then the management agreement will become part and parcel of the offer documents (by PNB). Until then, we are not allowed to talk about it,” said Liew. In late-September, PNB and parties acting in concert announced a takeover bid of the property developer at RM3.90 per SP Setia share and 91 sen per warrant. 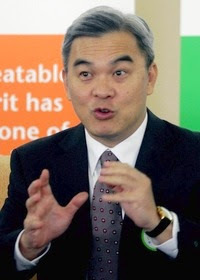 Liew added that the proposed management agreement, which was thrashed out over the last six weeks, was the first of its kind in Malaysia. Hence, the SC may require the company to hold an EGM. Liew said in the event the proposed management agreement was not approved by the SC, SP Setia could make an appeal to the regulator. Last Friday, Bursa Malaysia was told that SP Setia, Liew and PNB had proposed to enter into an agreement to formalise the incentives and management rights relating to the management and general conduct of the business of SP Setia. A recent StarBiz report quoted a source as saying PNB might be paying out lucrative bonuses and stock options to SP Setia’s top management staff in order to persuade them to stay on with the group. There had been fears expressed earlier that PNB’s move to take control of SP Setia might lead to an exodus of the group’s management staff. 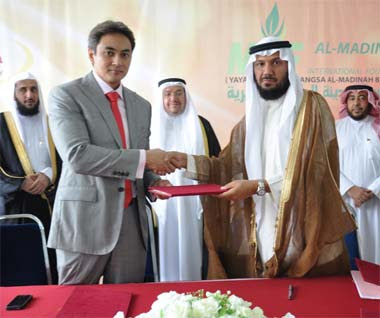 Rahadian (left) exchanging documents with Al-Madinah International Foundation chairman Professor Ahmad A A Al-Sheha. KUALA LUMPUR: Magna Prima Bhd will launch property projects with gross development value (GDV) totalling RM700mil next year. These included Boulevard Business Park Phase 2 in Jalan Kuching, Kuala Lumpur, consisting of serviced apartments with a GDV of RM220mil, executive director Datuk Rahadian Mahmud Mohammad Khalil said. He was speaking to reporters after an agreement signing for the sale of the company's U1 office tower blocks to the Al-Madinah International Foundation. The 15-storey single tower in Shah Alam with about 92,700 sq ft of gross floor space has a GDV of RM29mil. The Middle Eastern-based educational foundation, which will be the sole tenant, will rename the building MIF Tower and will make it its headquarters. Rahadian said Magna Prima would also launch the second phase of its Alam d'16 consisting superlink homes in Shah Alam with a GDV of RM210mil and its first overseas property project, Dynasty Living, in Melbourne, Australia, with the remaining unsold GDV of RM270mil. “We will offer this remainder of the Australian apartments, which have been 60% sold so far, to locals in January 2012. This development is located in the central business district opposite Victoria Market, a very prime location,” he said. Rahadian said the Australian system for selling properties was different from Malaysia as “Australia practices the build-then-sell concept, which means Magna Prima would not be able to realise revenue from its Australian development until the handover is done”. “We have to build first while the initial 10% deposit paid by buyers will be placed in a trust fund. We use our own money to build for the time being,” he added. Rahadian said property sales were expected to remain good next year. “We think there are concerns for office space but the outlook for residential property market remains good,” he said. SINGAPORE: Shares of Singapore developers fell sharply after the government took new steps to cool property prices with the toughest measures aimed at foreign buyers who have become increasingly visible in the residential sector. Effective yesterday, buyers who are not Singapore citizens or permanent residents will have to pay an additional 10% stamp duty when they buy a home, effectively raising the purchase price by 10%. Previous policy measures had targeted speculators by imposing an extra duty on those who bought and sold properties within four years and limiting the amount of loans available to prospective buyers. “It probably signals a change in policy. The government had previously been very consistent in welcoming foreign investments, so that is why the new policy came as a shock,” said Colin Tan, head of research and consultancy at Chesterton Suntec International. Singapore residential prices have held up well despite a slowing economy, helped by low interest rates and rising demand from overseas investors, in particular those from China. The surprise an-nouncement on Wednesday night hit shares of property developers yesterday. CapitaLand Ltd, South-East Asia's largest developer, fell as much as 8% to S$2.40, while No. 2 ranked City Developments Ltd dropped 7.3% to S$9.29. Shares of Ho Bee Investment Ltd, which focuses on high-end condominiums, fell by as much as 12.1% to S$1.09. PETALING JAYA: Hektar Real Estate Investment Trust’s (REIT) trustee AmTrustee Bhd has entered into two conditional sale and purchase agreements for the acquisition of two malls from Sri Awona Sdn Bhd and Awona Land Sdn Bhd for a total RM181mil. The trustee signed an agreement for a freehold three-storey mall, Landmark Central Shopping Centre, located in Kulim worth RM98mil and another agreement worth RM98mil for 110 strata parcels within the freehold six-storey Central Square Shopping Centre in Sungai Patani, Kedah.